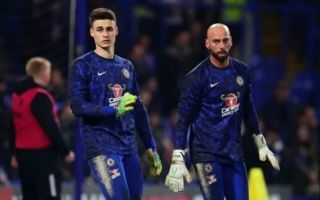 Chelsea goalkeeper Willy Caballero has revealed how his team-mate Kepa Arrizabalaga responded to being dropped for the win over Tottenham on Wednesday night. The Spanish shot-stopper caused quite a stir for the Blues in their last game, refusing to be subbed off in the Carabao Cup final defeat to Manchester City at Wembley on Sunday. Chelsea confirmed punishment for Kepa with a statement on their official site earlier this week, and it is not too surprising to see that manager Maurizio Sarri opted to drop the 24-year-old for the Spurs game. Caballero came in in his place, having failed to do so when Sarri tried to get him on the pitch at Wembley, and he played down the whole affair when speaking after the game. The Argentine praised Kepa for his response to being dropped, saying he doesn’t care and that he’s been ‘fantastic’ in offering his support to his replacement between the sticks. ‘The very good news is that he doesn’t care what happened. We are ready and Kepa was fantastic today in supporting me,’ Caballero told BT Sport, as quoted by the Metro. Chelsea fans will be delighted to hear of this positive team spirit after a difficult season a perceived low mood within Stamford Bridge.